Prostate cancer is the second most common cancer in men and the fifth leading cause of death from cancer in men worldwide, according to 2012 numbers. While several viable treatment options for prostate cancer exist, many men affected with prostate cancer will not respond to first-line treatments. Researchers in the Department of Pharmaceutical Sciences at the Leslie Dan Faculty of Pharmacy, University of Toronto have developed a new technology for liquid biopsy to identify which patients may not respond to standard therapy before it is delivered. "Screening for drug resistance is key to improving treatment approaches for many cancers," said Shana Kelley, scientist and professor at the Leslie Dan Faculty of Pharmacy, University of Toronto. "It's important for patients not to be on a therapy that won't help them and it's also important for healthcare systems to avoid, whenever possible, delivering ineffective treatments." Kelley, lead investigator on the study published today in Nature Chemistry, explained how her team has advanced a completely new approach using magnetic nanoparticles with DNA capture probes on their surface that can target circulating tumour cells (CTCs) in blood samples to see if the cells contains biomarkers associated with drug resistance. 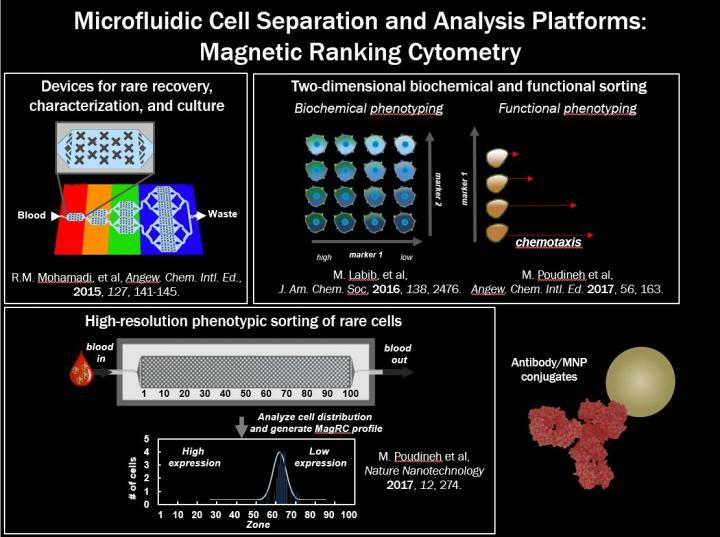 "We can then trap the individual magnetized cells in a microfluidic device built in the lab, isolating them from all the other cells in the sample and allowing us to perform highly sensitive analysis," Kelley said. The cells with the highest magnetic content will also have high mRNA expression for the biomarker associated with drug resistance. "This means that patients with high mRNA expression should be considered for other therapies because they won't respond to the first-line treatment." Targeting CTCs, the cells responsible for spreading cancer, is important because they carry information from the primary tumour that can inform treatment; however, they are outnumbered by a billion-to-one by normal cells in a patient' blood and are therefore extremely challenging to capture. In 2016, Kelley and her team published a study in Nature Nanotechnology that first introduced the microfluidic device and how it could be used to trap and analyze CTCs. The current study builds on this previous work by further targeting a specific biomarker within the CTCs. "We are very excited because this is like finding a needle in a haystack. It paves the way for a straightforward and personalized screening tool that allows clinicians to see if a patient will respond to therapy or not. Our method is also rapid, accurate and inexpensive, which gives it real potential for clinical uptake," said Kelley. As for next steps, the finding must be replicated in a larger study, Kelley explained. Her team is also focused on "scaling up" and expanding the application of this technology to other forms of cancer and other diseases. "Liquid biopsy is one of the most promising tools emerging for the management of cancer," said Kelley "and we are excited about the potential of our technology to streamline this type of testing."